(transitive) When a task or duty occupies much of your time, or when a person or item occupies space. Reading for my courses takes up a lot of my time. Much of my day is taken up by meetings at work. The new sofa takes up too much of my living room space. (transitive) When someone begins a new hobby to do in their leisure time. Synonyms are begin and commence. She has taken up knitting. He took up playing baseball at a young age and now plays for the Boston Red Sox. What new sport should I take up in my free time? (transitive) to make a piece of clothing or fabric, normally a skirt or the legs of pants, shorter. She asked for her skirt to be taken up above the knee. We had to take up the curtains so they wouldn’t drag along the ground. My dress is too long. I think I will take it up. 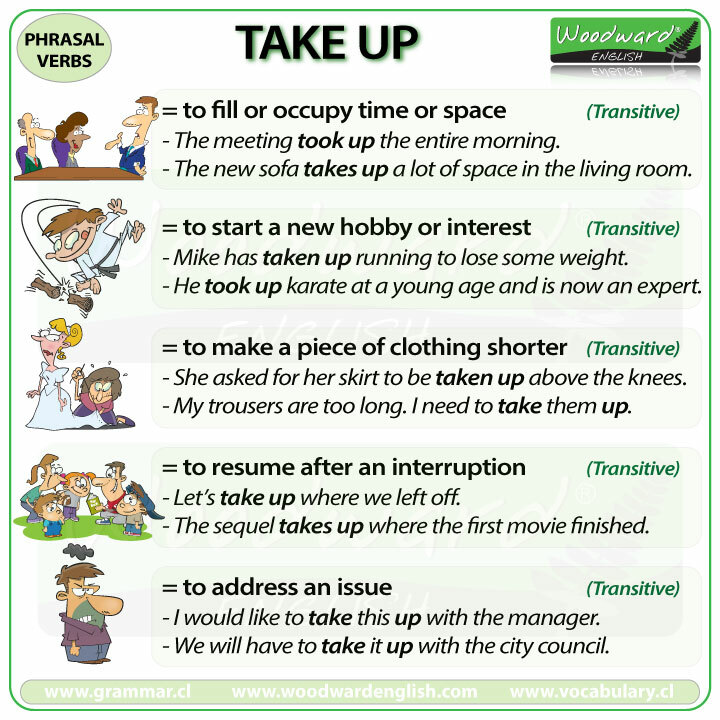 (transitive) to continue with something after an interruption or where someone else finished. Now, we will take up where we left on page 89. The sequel takes up where the first movie finished. (transitive) to speak to someone about something to see if they can help with that situation. I would like to take this up with the manager. We should take this matter up with the city council. (transitive) to accept an invitation, a challenge, an offer or a bet. I’ll take you up on your offer to help me tomorrow. You think you can beat me in a race? I’ll take you up on that challenge.